i actually liked the ending for this movie.i think the train is a symbol for the distance between them. it parted them in their teenage and now that they've grown up. its so﻿ sad though. but in the end, they couldnt even see each other. the train blocked their view of each other.all in all the ending was very strong and sad. i would HIGHLY recommend this to anyone with a interest of drama and romance. 5 centimeters per second, the time when cherry blossoms. This Movie is about Takaki Tohno and his childhood love Akari Shinohara whom tells the story of how beautiful there pure and innocent there love is from childhood to bad circumstances that drifts them away from each other. The story speaks in point of view Takaki Tohno, whom fights events and time then ultimately himself to keep his love Akari Shinohara at bay. Will he finally meet Akari Shinohara again? Will he enjoy life with his first love? The story holds all secrets. From the beginning of the story, the story slowly unveils in such a eloquent way, since Shinkai manages to tell the audience enough to understand the relations with both Takaki and Akari that start to care about their happiness. Then the plots starts moving a bit quicker coming to the second set of the movie where Takaki meets Kanae Sumida and how there relations starts and ends. The 2nd plot mainly focuses on Kanae in order to give a perspective of what people see of Takaki but importantly her love for him. The last ends in great art, but will only say that the sequence played perfectly in able to show the last section and end it with good feeling. The music is every bit important to storyline and the animation, as the music played the ambience and tone of which are emotions contain. When a great thing happens, the beautiful played of TENMON in piano starts which the audience feels a great deal happiness. Every action and event from the first section is placed perfectly. The music of One more time, One more chance is the best picked song that suited with this movie, I can't say where it will be played but where it was set made the movie perfect since with it's lyrics and tone of the song was the movie needed. There's only two main characters in the movie but not in the book, in the movie it focused on Takaki Tohno and Akira Sunohara, the character development was at it's best since we saw them grow as a person and as individuals, for a 1 hour set the development was at 5 centimeter per second. The Character interaction is worth nothing as every facial expression can be seen from each scene whether they are angry or sad, they gave the characters life. The Art is superb, seeing how real and beautiful the areas where the stories take place. Truth be told, that each place that is drawn is an actual place around Japan, As the Shinkai did a great job taking and drawing the right scenes to play adding how real they look even the desk that Takaki goes to school was very accurate. The Character drawings isn't worth noting other then that they will cleanly drawn and colored to the exact shadows and folds of the clothing. 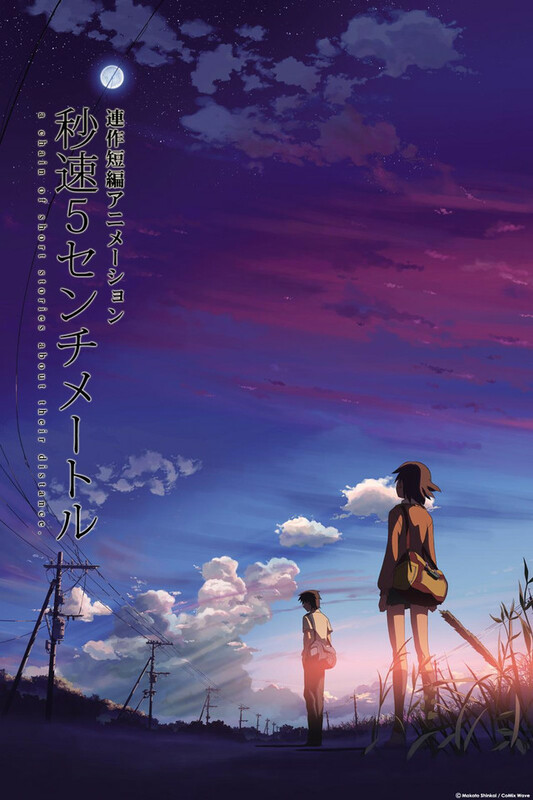 5 centimeters per second is worth a watch for all audience as everyone will enjoy a masterpiece that Makoto Shinkai has made though romance genre will truly love this movie. It is worth to own on DVD and as the movie is masterpiece which won't get boring watching all over again. As Shinkai description of the movie " it's the distance between the souls of Two people.and the speed at which they meet one another". 5 Centimeters Per Second was the kind of small drama I would watch everyday. The animation was very beautiful and flawless. It seemed so real. The music was wonderful and fit very well into the whole drama. I like the character in the second episode(I forgot her name) she was very innocent and i felt sorry for her. I guess the only thing that i wasn't so fond of, was how the two of them distanced themselves from each other. It was sad but i couldn't quite understand it. Overall i thought it was excellent!! When the ending montage started in, I was a little confused. All I could think was, that's it it?! But as I watched the montage, I realized that the song and the montage told the rest of the story & filled in the gaps. Takaki & Akari grew apart with time but while Akari moved on with her life, Takaki never did. It's really sad watching it and the realization that Takaki comes to that leds to his quiting his job. I'd like to believe that Akari and Takaki a crossing at the train crossing while the cherry blossoms were falling was a turning point for him. Even though it's shown at a different point in the story line vs the montage (ending sceene), since he smiles and walks away, I think he's come to the realization it's time to move on. A Masterpiece that goes beyond my expectations. This was one of the most romantic, yet saddest movie I have watched during this event and month. It starts out all childish and pure, and still yet pure as we move along their lives. The first person narrative connects really well, and we can truly see Tono's pain throughout. The stories were short, but they had such an impact. It felt like I was being hit by a baseball like force. Short intervals in music made me much happier, since I loved the soft piano sounds, and it was also timed perfectly in my opinion. The story itself was worth crying for. Those the main things that caught me and my heart. Sometimes, I wished there had been a happier ending for Tono. Akari was happy with her husband though. People change. Sumida seemed to be living quite well. But, yet, who was that black haired twin braided woman? A colleague? That was the only confusing point. "Let it go. People change." Just finished watching it, and the story line touched me deeply, It's able to move you, and make you sight, and lightly tilt your head at the things this work of art let's you experience. Takaki Tono and Akari Shinohara were close childhood friend, until they graduated from primary school. Akari have to moved to Tochigi and Takaki still remain Tokyo. Six months after Akari left, Takaki received letter from her. Since then they became friend-letter. Time goes by, Takaki want to tell Akari that he had transferred to somewhere else more far than Tokyo-Tochigi, he decide to come to Akari’s place and saying good bye. Takaki starting archery in his senior high school. Among his classmate there Sumida Kanae, a surfer girl who got crush on him. Sumida used to get together with Tono, after school, buy at shop, something she afraid is Tono looked always writing message on his phone. One day, Sumida did rode on wave, she has courage to tell Tone about her feeling, but it can’t be help. She end up crying. Both Tono and Akira had dream about their past. The last, ending theme with final scenes. Had to watch this multiple times and as a fellow artist superb work. I am ecstatic for the detail. One of my most favorite artists and with such a solid story line which really is memorizing. I would like to know what they used for the animation for the anime. I will be looking for future pieces by this artist. Must watch this if you enjoy true love stories. Gives hope to the world if love as such may be true. Unbelievable animation, and nice story line. To keep this simple, 5 Centimeters Per Second was indeed, a very nice anime-movie to watch. The storyline: I really enjoyed the story, until the end. I can't say I enjoyed the final chapter at all, really. It feels incomplete to me; I feel as if Takaki should have gotten a better ending. Not just a smile and acceptance, since this was all about him. I'm happy (for the most part) for Akari, but of course the fangirl inside of me is also unhappy she didn't hold on for Takaki. All in all, this was more heartbreaking than love-y for me. Beautiful, in many ways, but still a heartbreaker. The music: I was happy with the musical choices, nothing clicked to me as if to say 'this sounds out of place', therefore i'm rather content here. Characters: They were all well developed. I liked getting to learn bits of their history as the story unfolded and I also thought it was really nice getting to see each characters point of view. Animation: This is what drew me in to watch 5 Centimeters Per Second. Absolutely breathtaking. I have never seen such captivating work in an anime before. I highly recommend others to watch this anime for the graphics at the very least. So so SO stunning. 5 Centimeters per Second is a heartwarming story of timeless love. Besides the good animation and music, the main attraction of this masterpiece is its excellent storyline and realistic characters. The movie shows the happiness of finding love, the joy of being in love and being loved, the pain of separation, and the truth that there are things we can never get back and that we must move on. The film shows what love is from different points of view. And for sure, we can relate to this movie for its realistic events, relationships, and outcome. This is a story of real life. And it will touch you to the very center of your soul. Maybe you will cry, or maybe you won't. But one thing for sure is that this movie shows us the truth and we see parts of our lives in this heartwarming and touching show of love.